This recognition is based on the evaluation of Sagitec’s steadfast commitment to helping the public pension and unemployment insurance industries adopt Microsoft Cloud-based solutions. The annual list of companies is selected by a panel of experts and members of CIOReview’s editorial board to recognize and promote technology entrepreneurship. “Sagitec Solutions is shortlisted to the list of 20 Most Promising Azure Solution Providers - 2017 by CIOReview magazine based on its innovative, tailor-made solutions for pension, provident fund, unemployment insurance, and healthcare and life sciences clients of all sizes,” said Jeevan George, Managing Editor of CIOReview. Sagitec helps clients modernize their IT applications and utilizes Microsoft Azure Government to move their clients to a more secure and hosted environment. This method of infrastructure hosting provides their clients immense flexibility to respond to fluctuating demands for service – especially important for the unemployment insurance industry that has to deal with the ebbs and flows of the job market. 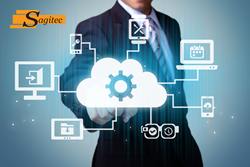 Furthermore, by hosting their line of business solutions on Microsoft Azure, Sagitec allows their clients to quickly update their solutions in response to law and policy changes. “By building on the Microsoft Cloud for Government platform, our clients gain a reliable, stable solution that is backed by the company’s ongoing commitment to serve the government community,” said David Minkkinen, Senior Partner, Sagitec Solutions. “We are happy to be recognized by CIOReview for our Azure-related services”. In addition to using Microsoft’s Azure Government Platform for hosting, Sagitec also uses Microsoft’s .NET technology stack to build their pension and unemployment insurance line of business solutions.